Tip #28 – If you’re planning a wedding in the mountains, carefully consider the items you will need to take to the site. Having a wedding in the beautiful outdoors is a great experience for the adventurous; however, it can be more challenging logistically. Whether you’re planning an outdoor ceremony at a lake, a camping style reception, or even a wedding at a rustic mountain lodge, you’ll want to carefully consider every item you’ll be taking to the site. The last thing you’ll want is to forget an essential element for your ceremony or reception! Carefully and meticulously going through a list of items required for both your ceremony and reception is important for any destination wedding in the mountains, but is especially true for weddings where you need to carry items in on foot, up a mountain in a gondola or transported via helicopter! Remember, what goes in, is also going to have to go out. You should pack only what’s absolutely necessary. Extra weight or extra trips could end up costing you. Organization is key. When possible, pack your gear in carefully labeled, clear bins. Inventory each bin and attach a list of contents to the outside of each bin so you know exactly what’s inside. If you can, try and keep ceremony and reception items separate. You may even want to label each bin according to how many overall bins, for example,“1 of 10”. Of course, you will likely need to recruit some extra help to get your gear where it needs to be. Surely, packing in gear isn’t something you want to be doing on your wedding day! Carefully wrap and protect breakables (if possible limit the amount of breakables you bring). Avoid overly bulky, heavy or large decor items. If you have heirlooms, valuables or custom-made decor items, package these separately and bring yourself or have someone responsible take care of them. If you’re being married in a natural setting, consider the environment. Sometimes less is more. Utilize a checklist. Check it twice. Remember, if something is inadvertently forgotten or misplaced, it isn’t the end of the world (in most cases). Stay focused on your sharing your special day with your loved ones instead. Contact Naturally Chic at 1.403.679.1409 or email at hello@naturallychic.ca. Tip # 12 – Consider road conditions on the mountain highways especially in winter. Weddings in the mountains, especially in winter, are incredibly beautiful. With snow-capped peaks and the promise of adventure, it’s no wonder winter weddings in the mountains are on the rise. If you’re thinking of having a winter wedding in the mountains, then it’s imperative that you consider the road conditions on the mountain highways, especially if you have guests that are not used to winter driving. There’s no doubt that winter weather can potentially affect guests’ safe arrival at your wedding destination. This isn’t to say that you shouldn’t have a wedding in the mountains, it just means that you and your guests need to take a few extra precautions. The Trans Canada Highway (#1) from Calgary to Banff (and on to Lake Louise) is generally well taken care of in winter, but winter driving conditions anywhere in Alberta can be stressful, at times, even for the most experienced drivers. It’s a good idea for you and your guests to pay careful attention to the local weather before embarking out on the roads. Environment Canada issues watches and advisories as winter conditions change. Warnings can include blizzards, heavy snowfall, wind chill, cold and freezing rain or drizzle. Preparation is key and the Alberta Motor Association (AMA), is a great place to start. AMA gives specific Mountain Park Road Reports on current road conditions for all sections of the mountain highways. They’ll let you know if the roads are in poor, fair or good condition. With the help of webcams, they’ll indicate if the roads are icy, snow covered or bare; they’ll even tell you how the shoulders are. For more information on winter driving conditions, check out AMA’s Winter Driving Tips. Naturally Chic can help with all your Canadian Rocky Mountain Destination Wedding needs, or visit our sister site Canadian Mountain Chic for more tips! Each day we have been sharing tips to help you plan your Canadian Rocky Mountain Destination Wedding in Banff, Canmore, Lake Louise and Jasper (and well, most everywhere in the Canadian Rockies!). Tip #5 – The temperature in the mountains can at times, get quite cool even in summer. If your are planning a tented reception or if part of your reception will take place outdoors or on a deck, consider your guests’ comfort level. Renting portable heaters and placing them strategically around the venue is one way to ward off chills. Wedding attire, especially in summer often means strapless dresses and lighter weight fabrics. Providing a basket of light throws or pashmina shawls for your guests’ use is always a considerate gesture. In winter, heavier blankets, mitts, scarves, and handwarmers would be a nice touch for a winter wedding! Whatever the season, its important to communicate to your guests the appropriate attire for your wedding so that they can be prepared. Comfort is key to a happy guest! Read Tip # 4 for Planning a Rocky Mountain Destination Wedding in Banff, Canmore, Lake Louise and Jasper here. We’ve been sharing tips for planning a Canadian Rocky Mountain Destination Wedding in Banff, Canmore, Lake Louise and Jasper, here’s Tip # 4 – Marriage Requirements in Alberta, Canada – What you need to know. So you’re planning on getting married in the Canadian Rockies – congratulations! Now what? Well, first off know that when you are married in Canada your marriage is valid most everywhere in the world and you can pretty much be married anywhere in Banff National Park. If you are flying into Alberta the closest airport to the Rocky Mountains is the Calgary International Airport. It’s approximately 1.5 hours to Canmore and an extra 15 minutes to the town of Banff. Lake Louise is approximately 30 minutes from Banff. If you are wanting to be married in Jasper National Park, you may want to fly into the Edmonton International Airport. Of course, you can reach Jasper from Calgary via the beautiful Icefields Parkway as well. Prior to your marriage, you will require an Alberta Marriage Licence which can be obtained from any registry office in Alberta. A valid marriage licence indicates that you’ve met the requirements to get married in Alberta and it’s valid for three months from the date of issue. So what do you need to obtain the marriage licence? You will need to fill out the application (your wedding planner can assist you with this prior to your arrival in Canada) and then you and your partner must appear in person at any Alberta registry office. It does not have to be the closest registry office to where you’re getting married. Count on this taking about an hour, but sometimes, especially in winter it may be less! Marriages may be performed with the aid of an interpreter if the couple does not speak English. No blood tests or waiting period means that you can be literally married on the same day that you arrive into Canada (keep in mind most registry offices are not open on weekends)! At Naturally Chic, we are pleased to assist couples with elopements or weddings on relatively short notice! Banff Bureau of Licensing & Registrations Ltd. Please note that requirements can change so contact Service Alberta for updated information. 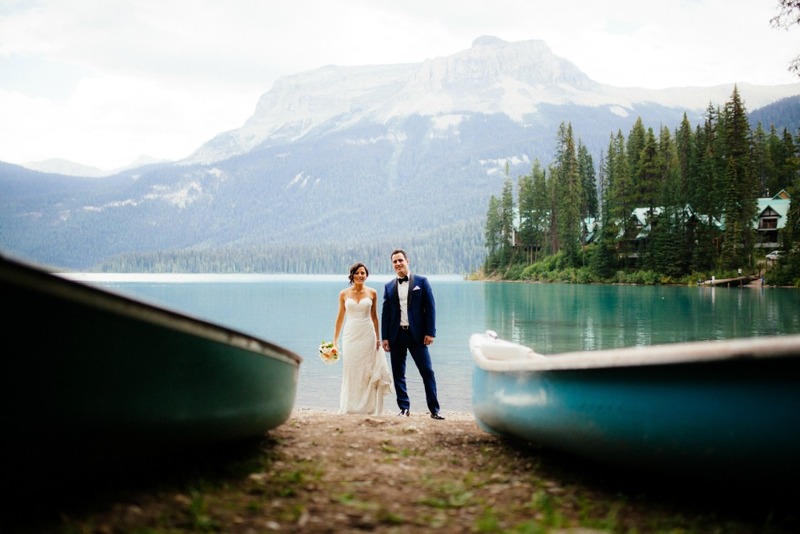 For more information on getting married in Banff National Park read Tip #3 – 30 Tips for Planning a Canadian Rocky Mountain Destination Wedding in Banff, Canmore, Lake Louise and Jasper. Contact Naturally Chic at 1.888.679.9056 or hello@naturallychic.ca for more information on planning your Canadian Rocky Mountain Destination wedding. Are you dreaming of a winter wedding in the mountains? There’s just something about a fresh blanket of snow that makes everything look fresh, clean and so beautiful. What could be more beautiful and intimate than a mountain lodge surrounded by fresh snow covered peaks, a cozy fire burning in a big stone fireplace, hot chocolate and candles glowing softly? 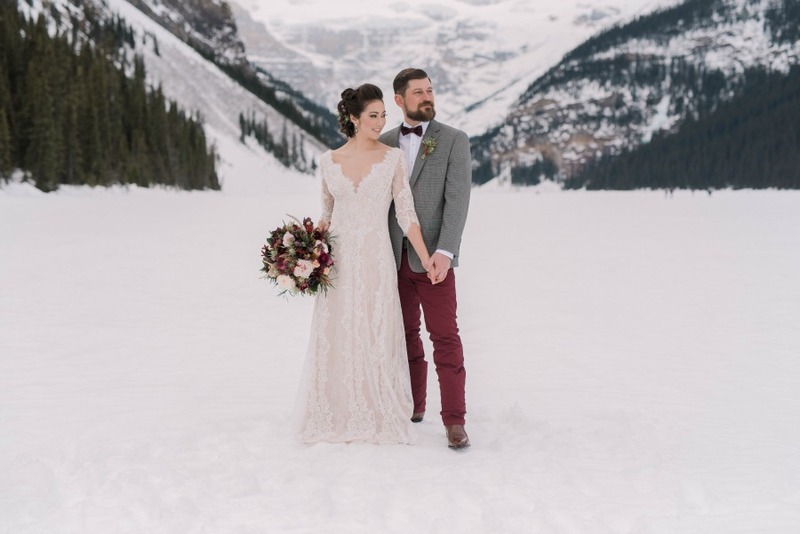 Winter weddings in the Canadian Rocky Mountains have so much to offer and there are so many venues that are perfect for your winter wedding dreams. Here are a few images to kickstart your winter wedding dreaming. One of our favorite winter wedding venues in the Canadian Rockies is Emerald Lake Lodge. Here are some fun ideas for winter weddings. Contact us at Naturally Chic for assistance with your winter wedding in the Canadian Rocky Mountains, 1888.679.9056 or hello@naturallychic.ca. Let’s face it, it does get cold at times in the Canadian Rocky mountains. Of course, cold is relative and most Canadians are accustomed to a little cold – your wedding flowers on the other hand are probably not. If you’re considering an outdoor wedding ceremony during the winter months, whether its on the ski slopes or on the terrace of the Fairmont Banff Springs Hotel, you’ve probably given some thought to what kind of winter wedding bouquet you will stand up to the conditions. It only makes sense for winter brides to consider their bouquet choices. Silk flowers are the first thing that comes to mind for most brides and nowadays there are beautiful, realistic silk flower options at affordable prices (keep in mind you will pay more for higher quality silk flowers). But silk flowers aren’t the only alternative. There are several varieties of flowers and foliage that are hardy and stand up quite well to winter conditions. Remember the bouquets given to the medalists at the 2010 Olympic Games in Vancouver, B.C.? A bouquet made from ranunculus, tulips, anemones, berries and lamb’s ear make a good winter bouquet, like the one below. We’ve found a number of creative winter bouquet alternatives, such as a beautiful brooch bouquet made from vintage brooches and jewelry, vintage button bouquets, felt bouquets and even wood flower bouquets. Not only are these bouquets eco-friendly, but will no doubt last for years to come to! There really are so many alternatives for a winter bouquet; in fact, why carry a bouquet at all? Consider an evergreen wreath, a faux fur muff or even a lantern instead! Do you have some other creative options, drop us a line! What do you plan on carrying for your winter wedding? Naturally Chic 1.888.679.9056 or info@naturallychic.ca. Thank you so much Colleen and Ed for letting us share in your special day! We wish you all the best life has to offer! The last photo is by Naturally Chic. To Contact Naturally Chic for assistance with your eco-friendly wedding in Canmore or the Canadian Rocky Mountains, call us Toll free in North America at 1.888.679.9056 or email hello@naturallychic.ca. for more information. Is a Rocky Mountain Wedding Right for You? Is a Canadian Rocky Mountain wedding right for you? With renown picturesque beauty, arguably there’s nothing more beautiful or romantic than a wedding in the Rocky Mountains. Whether you’re contemplating an elegant, luxurious affair or a more serene, outdoor wedding there’s something for everyone. Think gorgeous mountain backdrops, world class food, accommodations, spas, golf and ski resorts, and the promise of adventure. Sounds magical right? Keep in mind perfect weddings don’t just happen. There are several important factors to keep in mind when planning a rocky mountain wedding. Unless you’re fortunate enough to call the Rocky Mountains home, mountain weddings are destination weddings. Destination weddings can be more complicated than a wedding at home, and require a clear game plan. Here are some things to consider. From hiring local wedding professionals, to traveling, a destination wedding takes more work. A local planner can be your greatest asset in securing caterers, florists, photographers, and other local vendors. Fortunately, local planner Naturally Chic knows the area and the best local vendors. They will assist you in finding the perfect outdoor ceremony location and reception venue that is suited to your style and budget. They will also let you know what permits you require. 2. A destination wedding means travel and accommodation expenses for you and your guests. Many of your guests will welcome a “mini- vacation” however, it’s a good idea to offer hotel and activity options for your guests at various price points. Block booking of hotel rooms is a good way to get a great deal for your guests. Keep in mind that it’s best to make arrangements well in advance. The mountains are a popular tourist destination and accommodations book up quickly. It’s also helpful to provide your guests a welcome package complete with maps, driving directions, places to eat. As well, information on activities and events happening in the area on the weekend of your Canadian Rocky Mountain wedding is helpful. 3. If your wedding is taking place within a Canadian National Park, your guests will also require a Park Pass. Make sure you and your guests allow extra time to get through Park gates as sometimes they can be quite busy! You wouldn’t want your guests to miss your ceremony! 4. National Parks have strict guidelines for outdoor weddings in the pristine mountain areas. Most outdoor areas in Banff National Park, require you to have no more than 25 guests, so as not to adversely impact the environment. You may not be permitted to set up chairs for your ceremony. Usually you can only set up one or two chairs for the elderly unless you are at a designated ceremony site. Fortunately, most mountain venues have gorgeous mountain views right on site. 5. If you’re contemplating a wedding in the mountains, you might be thinking about having an outdoor ceremony. Be prepared for anything! Mountain weather can be extremely unpredictable and often changes suddenly. Make sure your guests know the ceremony will be outdoors, and let them know to wear comfortable shoes and clothing. Dressing in layers is always a good idea! You should also have a “Plan B”, or indoor backup plan. Be aware that you usually have to make a ‘weather call’ well in advance. Allow plenty of time for decor set up, especially if your reception is in the same room as the ceremony and needs to be reconfigured. Whatever your decisions, stay positive. Keep your sense of humor and remain flexible. What’s important is that you’re getting married surrounded by your loved ones. 6. Stock up on plenty of sunblock, bug spray, umbrellas and water for you and your guests if you are planning on being outside in the mountains for any length of time. Bonus: Currently, vactioning in Canada is a great deal if you are traveling from the USA, UK or Australia! Your currency will go a lot further here! 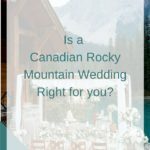 With a thoughtful approach and extra planning, a Canadian rocky mountain wedding can be a unique, unforgettable experience for everyone! You may even have some interesting ‘wedding crashers’. If you are contemplating a Banff wedding, Lake Louise wedding or a wedding anywhere in the Canadian Rocky Mountains, Naturally Chic would love to hear from you! Contact us at at hello@naturallychic.ca for more information. Is it any wonder that weekend weddings are becoming increasingly more popular? Weekend weddings in the Canadian Rocky mountains allow family and friends to gather for an unforgettable celebration with plenty of activity. The main idea is for your loved ones to get to know one another and to have fun. You don’t need a tropical location to keep your guests entertained and feeling loved either. 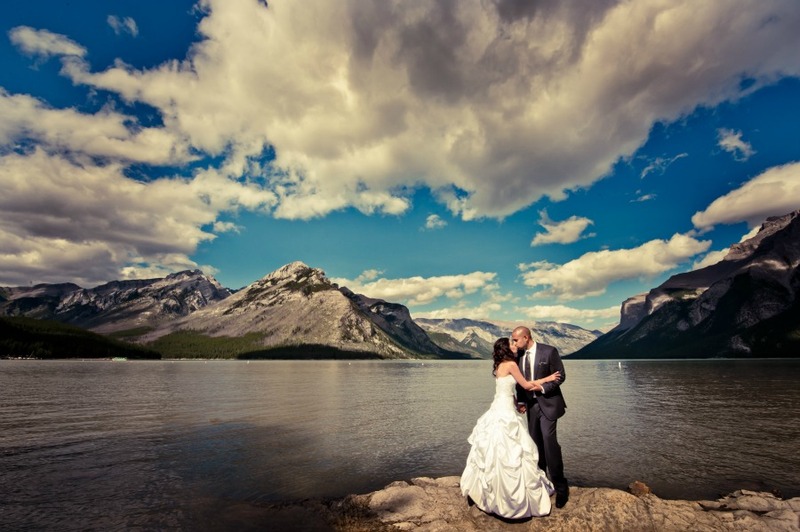 There are many fabulous places in the Canadian Rocky Mountains to be married including the destinations of Banff, Canmore, Lake Louise, Jasper and Emerald Lake. Not only are these destinations breathtakingly beautiful, but offer an unlimited promise of adventure and activity. These locations are known for their picturesque beauty and incredible year-round, adventurous activities such as skiing, hiking, mountain biking, rafting and so much more! A weekend wedding can be as casual or as extravagant as you’d like. It can take place at a lake or cabin, a beautiful mountain resort or just about anywhere. In general, the wedding weekend begins with a welcoming activity such as a casual barbecue or dinner. The following morning typically involves various activities such as a round of golf or a white water rafting excursion. Then everyone comes together for the wedding ceremony and reception which are usually a little later in the day in order to accommodate the various activities. Sometimes, the party will linger well into the evening with various festivities, followed by a farewell brunch to wrap up the weekend. Of course, you’ll want to personalize the activities based on the location you choose and your interests. 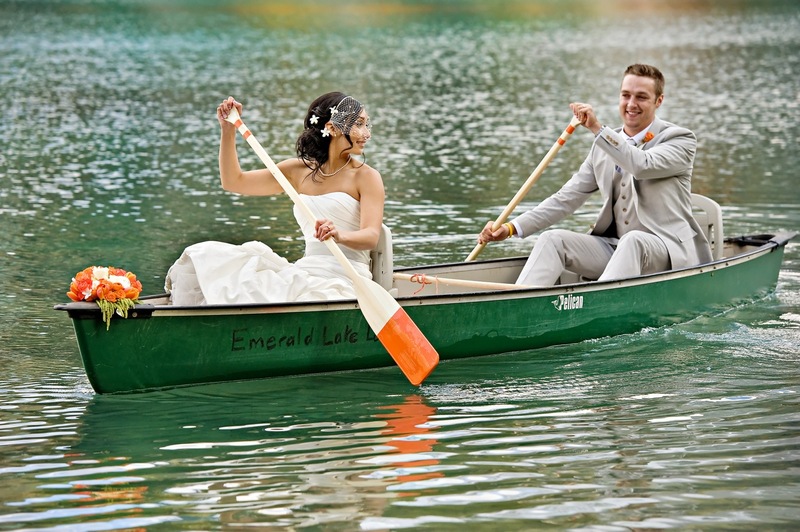 Two of our favorite picks for all-inclusive places to host a weekend wedding are Emerald Lake Lodge or the Fairmont Chateau Lake Louise. Both these locations are idyllic for an action packed weekend extravaganzas that don’t have to break the bank. 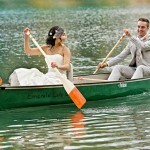 How about a camping style wedding at Emerald Lake complete with a welcome barbecue, canoe rides, a campfire, and smores? In winter, a weekend at the Lake Louise Ice Castle would certainly be memorable for wedding guests. Activities could include skating on the frozen lake, sleigh rides, skiing and a hot chocolate / espresso bar at your reception. Or, maybe an elegant castle in the mountains such as the Fairmont Banff Springs Hotel is more your style, where your guests could enjoy golfing, sightseeing, fine dining and a visit to the spa. Whatever your style or taste, a weekend wedding is a sure way for you and your loved ones to bond. Standard wedding etiquette does not necessitate that the couple pays for all the activities either. It’s common for various family members to host an activity. Oftentimes, it’s enough to just arrange the activities or provide information on activities that your guests can partake in. Most guests attending a weekend wedding will want to get out and experience the sites anyway. Most will treat your wedding as a mini-vacation or getaway weekend and they’ll appreciate having something to do. There are also plenty of activities such as a nature walk or hike that don’t require any expense at all. The key to a weekend wedding is to provide plenty of activities that appeal to all your guests young and old. Just don’t over-schedule your guests’ itinerary. It’s important to provide down times for your guests so they can explore the area or just relax in their hotel room. There’s really no better way to show your guests how much you care about them then by spending quality time with them. The immense value of a weekend wedding is that everyone feels appreciated and valued. With so many fabulous locations and activities to choose from, you can be sure that your weekend wedding in the Canadian Rockies will be unique, personal and an unforgettable experience for everyone involved. For more information on our WEEKEND WEDDING Services contact Naturally Chic! Credits: All planning and design by Naturally Chic; Photo 1: T.Law Photography; Photo 2: Orange Girl; Photo 3 Darren Roberts Photography; Photo 4: Yeuko Images.